Starfighters are an English heavy metal band from the New Wave of British Heavy Metal movement founded in Birmingham, England, in 1979. They attracted a strong British cult following but were not able to translate this into any lasting success, producing just two full studio albums in the early 1980s. Ex-member Stevie Young brought in some attention to the group after he joined the iconic hard rock band AC/DC in 2014. 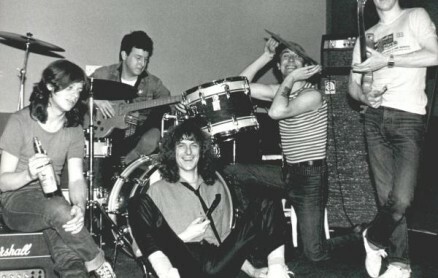 Initially called Savage (named after the original lead vocalist, Phil Savage), the founding members, Stevie Young and Barry Spencer Scrannage changed the band’s name to Starfighters and released the single, “Heaven and Hell” (A Side) and “I’m Falling” (B Side), on the independent record label, Motor City Rhythm Records. A further two single were recorded and produced in 1980, prior to the band winning their support slot, but were never released. This line-up consisted of Steve Burton (vocals), Pat Hambly (guitar) Stevie Young (guitar), Doug Dennis (bass) and Barry Spencer Scrannage (drums). They were then signed up by Jive Records (a part of Zomba). They then won a support slot with AC/DC on their 1980 ‘Back in Black’ tour, during which, Barry Spencer Scrannage left for personal reasons (the death of close personal friend, John Bonham), his position was later filled by Steve Bailey. (Stevie Young is the nephew of AC/DC leaders Malcolm and Angus Young). Signing up with Krokus manager Butch Stone, in 1983 they released the follow-up album, In-Flight Movie, again produced by Tony Platt. Jive however were not prepared to pay for further tour promotions, and the band resorted to appearing in small British clubs. Despite receiving good reviews and publicity, particularly in Kerrang! magazine, this album did no better and Jive dropped them. The band consequently folded. In 1987, the band reformed with the line-up of Burton (vocals), Young (guitars), Rik Sandford (guitars), Redvers (bass) and Jamie Hawkins (drums). Redvers had been known as Steve Hill up to this point, but was rechristened with his middle name, to avoid the confusion of having three ‘Steves’ in the band. Despite attracting a strong local following in Birmingham, they could not secure another recording contract, and the band folded after little more than a year. Sandford and Hawkins had very brief stints with UFO and Hawkwind respectively. Redvers became Steve Redvers and joined The Grip, before linking up with Young and Ian Charles (Chaz) in Little Big Horn. Starfighters reformed again for a one off show on 10 November 2006 at ‘The Roadhouse’ in South Birmingham to raise money for charity, with the line-up of Burton (vocals), Young (guitars and vocals), Hambly (guitars), Dennis (bass and vocals) and Tony Bayliss (drums). When bassist Doug Dennis died in 2011, the remaining Startfighters reformed to play at his wake with Stevie Young’s son Angus on bass. In May 2014, Stevie Young replaced his uncle Malcolm Young for the recording of a new AC/DC album and tour.